A fashionable dog collar can look outstanding if used in the right way. However, sometimes a standard collar that has a traditional solid look might not work for you. Nowadays, however, there are leather dog collars, designer dog collars, spike stud collars and many more to make your four-legged friend look super cool. 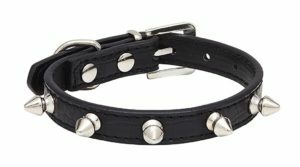 However, if you want your furry friend to really stand out, you should look to stud dog collars (or studded dog collars). 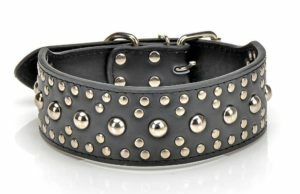 Whether you are looking for a big dog collar for your English bull terrier or one for a small dog like a poodle, a heavy duty studded dog collars are made in a number of sizes and designs. They come with great looks that add something appealing for any dog to wear. Some of these studs come with simulated diamonds while others have spikes but one thing is for certain in that these are all made to look impressive. 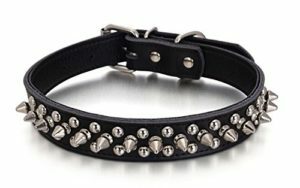 You should check out the studded dog collars that you will read about here. These are all made with fine bodies that add an attractive look onto any dog. Best of all, they are made to be easy to adjust without being overly complicated or hard to use. You should look at how well these can be applied onto any dog’s collar. Check out the overall fit of the collar. Make sure it is something that is easy to adjust based on your dog’s needs. You should be able to fit two fingers in between your dog’s neck and the end of the collar to see that it is not overly tight. Look at how well the studs are added into the collar. They should be affixed properly without being at risk of slipping off. You will have to manually remove any loose studs so they will not be at risk of being swallowed by your dog. See how strong the collar’s body is made. Leather materials are typically used for how they are dense and can support the studs in a collar. The studs should also be arranged to where they will not cover the entire collar. The key is to have some space to allow you to adjust or fasten the collar. The studs themselves should be applied around the front part of the collar so they will be the most visible. The first option to see is this collar that comes in five colors. It is made with polyurethane leather and a metal alloy. The alloy comes with a nickel plating to create a shiny look. Each collar has three rows of studs. The top and bottom rows feature basic circular studs. The middle row has a series of spikes that look pointy but are still rounded to make them easy to display. The buckle on the back end can also be adjusted in a number of positions and is easy to apply. 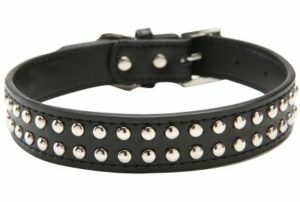 Real leather is the key feature on this studded collar to see. It uses a split body with stitching used to get two separate layers of leather affixed together. It also offers a buckle on the back and two rows of studs. These circular studs are made with silver-like appearances to make them look all the more attractive. An attractive part of this collar is that it is available in five colors. The studs will look the same on each one. Also, the buckle on the back part matches up with the studs in terms of its metallic finish. You can get this Pet Kingdom collar in one of three sizes. It is made with a polyurethane leather body and comes with five holes that link with the buckle fastener. The polyurethane leather body of this collar is about two inches wide in its largest form. As for the studs, there are three rows of these studs with the top and bottom features a series of smaller metallic studs arranged in threes. The middle offers a series of studs that are a little larger in size and organized in an even line to create a carefully organized look. The D-ring is also strong and will not corrode or wear out. It can support a leash including one that matches up with the collar. Give your dog an awesome look with this appealing collar. Available in six colors and four sizes, it has a singular row of spiky studs embossed in a silver-like tone. It is also made from polyurethane leather and is about half an inch wide.This is very easy to clean off. The color on the PU leather is also embossed well to where it will not carry over onto your dog’s fur. It does not irritate the hair all that much either. You can also use the buckle on the back end to adjust it in one of five positions. Rachel had made this in three sizes and five colors. 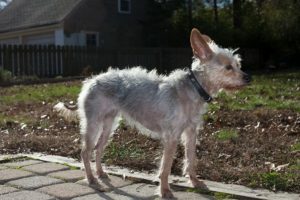 The smallest one can fit a dog’s neck at 10 inches at the smallest while the largest collar works at about 18 inches. The genuine leather on this collar has been secured by stitching features on both the top and bottom parts. The three rows of spikes include a series of pointed spikes on the middle row while the top and bottom feature some smaller circular studs. The belt buckle allows you to adjust the collar in a number of sizes. It can be adjusted quickly and will not become loose all that easily. It adds a comfortable look that is appealing and adds a special look when used right. These studded dog collars have a good look to them that make these attractive and brilliant for your dog to wear. Be certain that you look at these options when finding a comfortable collar that your dog will enjoy wearing while looking great with it.